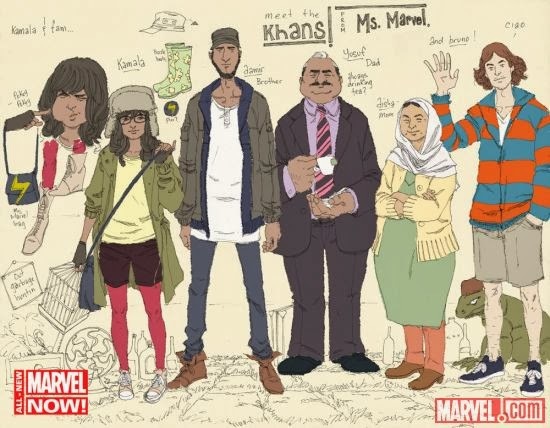 Kamala Khan as Ms. Marvel is the first comic book character from Marvel Entertainment who is both female and Muslim. It is part of the American comic giant's efforts to reflect a growing diversity among its readers. The new Ms. Marvel series is mainly the work of two women: G. Willow Wilson, a convert to Islam who created the character, and Sana Amanat who edits it. Here's how Wilson describes the main character of the comic: "Islam is both an essential part of her identity and something she struggles mightily with. She's not a poster girl for the religion, or some kind of token minority. She does not cover her hair –most American Muslim women don't—and she's going through a rebellious phase. She wants to go to parties and stay out past 9 PM and feel “normal.” Yet at the same time, she feels the need to defend her family and their beliefs". Ms. Wilson says the series is “about the universal experience of all American teenagers, feeling kind of isolated and finding what they are.” Though here, she told New York Times, that happens “through the lens of being a Muslim-American” with superpowers. 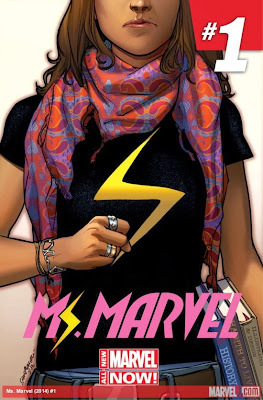 Elaborating on the superhero character, series editor Sana Amanat said the following in an interview published on Marvel.com website: "As much as Islam is a part of Kamala’s identity, this book isn’t preaching about religion or the Islamic faith in particular. It’s about what happens when you struggle with the labels imposed on you, and how that forms your sense of self. It’s a struggle we’ve all faced in one form or another, and isn’t just particular to Kamala because she’s Muslim. Her religion is just one aspect of the many ways she defines herself". The Marvel series is set for launch in February, 2014. Earlier this year, Pakistan's GeoTV launched Burka Avenger. Its superhero is a mild mannered school-teacher who fights feudal villains and terrorists getting in the way of girls' education. Burka Avenger series is inspired by the story of Malala Yousufzai, a Pakistan teenage school-girl who miraculously survived an assassination attempt by the Taliban in Swat valley last year. Malala has since become an international icon for girls' education worldwide. The United Nations declared Malala's 16th birthday this year on July 12 as Malala Day to focus on girls' education. In April 2013, Bashir Ahmad stood bleeding in a cage before a 12,000-person stadium crowd in Kallan, Singapore. Having defeated his Thai opponent, the mixed martial arts (MMA) fighter draped the green-and-white Pakistani flag across his shoulders and hoisted his gloved hands as the stadium. The crowd – along with a 500-million-person Asian TV audience – cheered for Pakistan's first national MMA champion. The accolade was made all the more precedent-breaking considering Ahmad's true identity: just a few years earlier, he had served in Iraq as a U.S. soldier. As relations between the U.S. and Pakistan remain strained due to drone strikes, Taliban attacks, and lingering resentment over the unauthorized commando raid on Osama bin Laden, Ahmad has become the unlikeliest of national heroes – an American soldier turned MMA champion. "I've gotten Facebook messages asking how I could be a part of the U.S. army and support the killing of Muslims," he says. "Does it get to me? No. My whole life has been a paradox." Born in Lahore in 1983, Ahmad moved as a child with his family to Great Falls, Virginia. In 2002, he joined the National Guard to fund his tuition at Virginia Commonwealth University – thinking he'd only spend one weekend a month doing military drills. "When I first got there and asked if they'd served in Afghanistan, they laughed and said 'We can't even make it to the highway without getting lost,'" Ahmad says. Yet nine months after the beginning of the Iraq war, in 2003, Ahmad was deployed to work as a medic on a bomb disposal unit in Mosul – a stronghold of the Sunni insurgency. "Have you seen the movie Hurt Locker?" he says. "That was my day-to-day life. We'd drive five times a day to wherever in the city there was a suspected IED or car bomb." Despite his rising star in Pakistan, Ahmad says his time there has shown him how essentially American he remains. "When I came here I was like, 'oh I'll fit right in'," Ahmad says. "No, I was definitely different – a foreigner." Pakistan's pervasive anti-American rhetoric and uncritical nationalism irritated him. "It's so mixed up, it's so ridiculous," he says about the country's political climate. "There are Pakistanis whose whole family is in the U.S. and they want a visa, yet they hate America." One of Ahmad's proudest achievements, beyond the fame and growing success of MMA in Pakistan, is having created something that erases, however modestly, Pakistan's social divides. "These two young waiters at a roadside restaurant told me their lives had changed," Ahmad says. "Guys who would usually order them around were now the same people looking up to them and saying, 'This guy fights for my gym.'" Ahmad is now splitting his time between Virginia and Pakistan while courting Pakistani expatriates to help fund his league – and admits to not feeling quite at home in either country. "The TSA held me for seven hours at Reagan airport, but then only questioned me for a couple of minutes," Ahmad says, "I expected it but was still like 'Screw you, I'm a vet.'" The Pakistani comic scene is spawning a dream team of superheroes who were born out of the local culture and tackle issues specific to the region. Set for online release in two months, a comic entitled “Shamsheer” by Udham Publications is one example of a home-grown comic that aims to present an “intrinsically Pakistani” story in pop-art format. “We as humans are hardwired to learn from stories,” Zakaullah Khan, co-creator of “Shamsheer,” told Al Arabiya News. Why not just import all-American comics? Why do the country’s comic lovers need Pakistani heroes? Despite the “Pakistani environment” of the forthcoming comic, “the issues we’re talking about are those of any developing country: violence on the streets, mugging and security issues,” he added. It’s just another day in the fictional town of Halwapur, when mayor Vadero Pajero orders local thug Baba Bandook to shut down the girls’ school. “What will girls do with education when they will grow up to scrub floors and cook meals,” they mock. But then the now-famous Burka Avenger swoops in. Using her takht kabaddi skills — combat with pens and books — she thwarts the evil plan and the school is reopened. A silent cultural revolution is brewing in Pakistan’s art, entertainment and literature scenes. It’s bold, tough and the people’s desperate desire for real change is unmistakable. “Positive role models are very important for Pakistani society. Real-life people can turn out to be imperfect but fictional characters can be projected with the highest morals and values. Wonder Woman or Catwoman may not resonate in Pakistani society, but Burka Avenger does,” says Haroon Rashid, its creator, who is a pop star. The character was number nine on Time magazine’s list of most influential characters of 2013 and there are talks of broadcasting the show in 60 countries soon. Burka Avenger’s key theme is educating girls and women, which is especially significant in a country with profoundly conservative areas. This is also reflected in real-life hero Malala Yousafzai’s goals. Yousafzai is known for being an education and women’s rights activist, which got her shot by the Taliban in 2012. Syed Hamdani created Sergeant Pakistan as a comic and a set of ongoing novellas so that Pakistani kids could look up to someone with humble beginnings who stands up against terrorism. “While watching the news one day, I saw a report of children playing suicide bombers in a game. I have a six-year-old son and I couldn’t stand watching that. It is a failure of humanity if children portray themselves as terrorists,” he says. The first novella is out on Amazon’s Kindle device and proceeds from the project will go to charity. English-language film has already garnered 148,922 likes on Facebook. “Nation Awakes will deal with things on a global level, where Pakistan will fight for humanity in general. For most people it will be a very different experience to watch a Muslim superhero in action for the first time. The basic aim of this film is to change perceptions,” says Sajjad. Richard Parker swims in the Life of Pi ocean. Afterwards, the 10 million hair on the Bengal tiger’s body are wiped down, his fur gradually morphing from dripping wet to dry. In Frozen, we watch the little girl Elsa create snowfall and her enchanting ice world emerge. The line between fantasy and reality blurs, so real are the images. But this much is clear; the artist behind this graphic wizardry deserves the three Oscar awards he has received in six years. The recognition from the industry for Pakistani visual effects artist, 38-year-old Mir Zafar Ali, has been nothing short of a dream come true. His latest Academy Award, for Frozen, was the first in the animation category for the Walt Disney Animation Studios. The 3D musical fantasy-comedy film is now the highest-grossing animated film in history, beating the Lion King and Toy Story 3. It has also made it to the top 10 biggest films, leaving far behind the likes of Star Wars and the Pirates of the Caribbean series. Ali’s first Oscar came for The Golden Compass in 2008. He recalls the moment as being “very, very surreal.” “My wife Tamanna Shah was working at Paramount Studios at the time and we were invited to one of their Oscar parties. So we’re talking to people, having a good time and then the nomination for the best visual effects category came up and I almost dropped my drink when they announced The Golden Compass as the winner,” he said in a telephone interview with The Express Tribune. It was a tough competition. They had been up against Transformers and Pirates of the Caribbean: At World’s End. “It took a good few seconds to sink in,” he recalled. Ali’s forte is to mainly recreate natural phenomena such as water, fire, destruction and snow as well as visually recreate fantasy. This takes hundreds of hours of reference research, watching footage of natural phenomena such as tsunamis and storms and poring over science papers. His second Academy Award came last year for the Life of Pi, a movie based on Yann Martel’s acclaimed novel. The Bengal tiger named Richard Parker stars in most sequences, although the real 300-pound tiger was only used when Pi and Richard are not in the same shot. The rest of the scenes consist of computer-generated images that give life to an extremely challenging script. It was in Life of Pi that a real animal and a digital one were used interchangeably for the first time. A team of 15 people were dedicated to creating just the fur by placing and combing all 10 million hair on his body. Ali grew up in Karachi watching a wide range of films and was particularly interested in science-fiction and fantasy movies. Jurassic Park was his first main inspiration. “It completely blew me away!” he said. He studied at the BeaconHouse School Systems and always wanted to go to art school. “But back in the day, going to art school wasn’t thought of as a good career move — hell, it’s still not thought of as a good career move,” he admitted. As a result, it took him a while to figure out what he wanted to do.. The 36-year-old filmmaker got her first break in 2001. She was offered a chance by the New York Times Television production company to make her film Terror's Children. In the film, she documented the lives of eight Afghan children that were refugees in the city of Karachi and showcased their daily struggles. In 2012, eleven years after that first chance, Chinoy won an Oscar for her film Saving Face, which chronicles the journey of a plastic surgeon who treats acid attack victims. Her work's main focus is on human rights and gender issues. Her film Pakistan's Taliban Generation won an Emmy in 2010. Chinoy has, meanwhile, produced 12 award winning documentaries in 10 countries. She is also the founder of The Citizens archive of Pakistan (CAP), a nonprofit organization dedicated to cultural and historic preservation which educates citizens about their heritage. In a DW interview, Chinoy talks about her latest project Three Braves (Teen Bahadur), an animation film for children, and the changing face of Pakistan's film industry. DW: Tell us about your latest project Three Braves (Teen Bahadur). Sharmeen Obaid-Chinoy: Three Braves is a quintessentially a Pakistani story - replete with unlikely heroes, menacing villains, fumbling thugs, dark horses, and moments of triumph and bouts of despair. Based in a fictional town in Pakistan, eleven-year-old Amna, Saadi and Kamil set out to save their community from the many evils that plague it. This film is fiction and very different from your previous line of work. What made you choose this medium? Chinoy says Pakistani film industry stands to be "a formidable force in the near future"
I had wanted to do something for children for a long time because we, as a nation, have completely neglected this demographic. Our youth makes up the largest and, undoubtedly, the most important section of our society and now more than ever, they need local heroes to look up to. After experimenting with many mediums, we settled on animation because its creative freedom allows us to speak to children in a way that no other medium can. I want Pakistani children from every nook and cranny to see Three Braves and be entertained and inspired. I want them to finally be able to see their reflection in movies, with superheroes that look and speak like them. What kind of subtle messages are packed into your film Three Braves? The great thing about animation is it offers a lot of scope for creativity and imagination. On the surface Three Braves might appear to be about superheroes and mystical creatures. But underneath that commercial cartoon value is a force that seeks to engage, empower and motivate today's youth. The film is a journey of fighting back, taking charge, and finding support and love in the most improbable of places. San Franciscans have been getting a dose of real live super-heroics lately, after an anonymous do-gooder took it upon themselves to do battle against a series of Islamophobic bus ads in the single most awesome way possible: By calling upon the highest profile Muslim superhero in the Marvel comics universe. Recently riders of the San Francisco bus system have been forced to make their daily commutes to and from work on busses with covered in ads which compare Muslims to Nazis, and call for an end to all US aid to Muslim countries. Purchased by the American Freedom Defense Initiative (a wing of Stop Islamification Of America – an organization listed by the Southern Poverty Law Center as a hate group) the ads are similar to ones the group has run in both Washington DC and New York. Knowing San Francisco, and that city’s history of proud progressivism, it’s not surprising, then, that the offensive ads provoked a strong reaction. What is surprising, though, is just how wonderful the response has been. As first noticed by Street Cred – Advertising For The People’s Facebook page, someone has been, *erm* “upgrading” the ads by plastering them over with images of Kamala Khan, known to comic book fans as Ms. Marvel. All of us know that the legendary singer and global icon Nusrat Fateh Ali Khan had composed music for Dead Man Walking, Bone Collector, and Last Temptation of Christ. And we also know that the youth icon Atif Aslam sang for Man Push Cart and The Reluctant Fundamentalist. But do you know of Pakistanis other than Adnan Siddiqui, Faran Tahir and Sharmeen Obaid Chinoy who made it big in Hollywood? Chances are slim, we bring you 10 unsung heroes who are making Pakistanis across the world proud. The news reporter in Philadelphia at KYW-TV, initially appeared on MTV’s Rachael Ray Show and Law & Order. She got her big break in 2011 by becoming a news anchor at CBS for the First Forecast Mornings show in Detroit station. She has also participated in a number of beauty pageants and was the 1st runner up in the Miss Pennsylvania USA pageant. The Karachi-born popular screenwriter, director and novelist has written and produced the NBC series Kings. Some of his other works include NBC’s Bionic Woman, The CW’s Nikita, Disney’s Tron: Uprising and Sleeper Cell – nominated for the Golden Globe and Emmy Awards in Best Miniseries category in 2005 and 2006. The actor is known as Principal Figgins in Fox series Glee. He has appeared in 58 episodes throughout the six seasons. He rose to fame after appearing in Friends and Nip/Tuck. He was featured in other famous shows including, The George Carlin Show, Married With Children, ER, Two And A Half Men, Seinfeld and Everybody Loves Raymond. He was also seen in Transformers: Dark of the Moon. The writer and actor is the proud recipient of 2013 Pulitzer Prize for Drama. He has written plays for the stage including Disgraced, The Invisible Hand and The Who and The What. He made his debut as a novelist with American Dervesh in 2012. If you have seen The Golden Compass, Spiderman 3, X Men: First Class and Life of Pi, you should feel proud to know that the visual effects were created by none other than a Pakistani specialist. The credit of portraying Angelina Jolie as the picture-perfect villain in Malificent goes to none other than software engineer Novaira. She worked with her team to create inimitable special effects. She has also worked on other Hollywood films such as A Christmas Carol, Mars needs Moms, Thor, Transformers 3 and Jack the Giant Slayer. Syed Fuad Ahmed — now known as Gabe Grey — was born in Karachi. The 32-year-old actor was seen in The Haircut, One Last Shot and Bomb Girls: Facing the Enemy. He has also attended the Model and Talent Search Canada in 2005. He will soon be seen in Deepa Mehta’s directorial Beeba Boys alongside Ali Kazmi. Umar got his big break by playing the lead role of Robert Martinez in Veracious Perception. He was also seen in the films Miami Heat, The Hitman, The Test, Deliver Us From Evil, Captain America: Civil War, The Hunger Games: Mockingjay and District Voices. The Lahore-born actor also possesses martial arts skills. The New York City-based filmmaker and author has written The Girl from Foreign: A Search for Shipwrecked Ancestors and Lost Loves. She has also produced the documentary The September Issue that featured the making of Vogue. It has won the Excellence in Cinematography Award at Sundance Film Festival in 2009. The screenwriter has written for some of the popular television series such as Aliens in America, Mr. Sunshine, Outsourced, Save Us, then the Whales and Emmy Award-winning series Modern Family. He has also won an award for his short film Equal Opportunity. Sameer is currently working on Fox’s Goodwin Games. As a woman and a Pakistani American, Amanat has made it her mission to redefine what is possible for women and people of color in an industry dominated by white men. Through her work as an editor on comic books like Captain Marvel, Hawkeye, and Ms. Marvel, she has helped reimagine what superheroes can be. Last year, the first issue of Ms. Marvel — a series and character that Amanat co-created with editor Steve Wacker, writer G. Willow Wilson, and artist Adrian Alphona — went into its seventh printing, a level of success that's extremely rare. Earlier this year, Amanat was introduced to National Book Award winner Ta-Nehisi Coates — that initial introduction would later develop into a successful deal orchestrated by editor Will Moss, Marvel's VP of Publishing Tom Brevoort, and Editor-in-Chief Axel Alonso to bring Coates to Marvel and write the new Black Panther comic book series. "My long title of director of content and character development — I always forget it," she tells me about four weeks after New York Comic Con. I've caught her on a busy Monday. "I still double-check my card and ask, 'What am I?'" "Just call yourself Ms. Marvel," I joke. "That's what my nephew calls me. He's 5 now. It's super cute. I think he's kind of messing with me." There's something poetic about the fact that Amanat is a huge fan of Shonda Rhimes, one of the most powerful showrunners in the television industry and the woman who created the hit shows Grey's Anatomy and Scandal. Rhimes has mastered the art of what Amanat calls the "oh no," the gasp-inducing moments that pepper her sudsy, kinetic dramas. And when you think about it, Rhimes's TV shows, with their hyper swerves and hurtling dialogue, are a bit like live-action comic books. "You need the 'oh nos.' That's the beauty of serialized storytelling. That's what Shonda does so well," Amanat tells me. But Amanat and Rhimes have more in common than a love of drama and the utmost respect for Scandal star Kerry Washington. What Rhimes has done for ABC — create great, diverse work that's gone on to inspire more diversity in the network's programming — Amanat is doing for Marvel. Since her promotion, her editing duties have been streamlined to Captain Marvel, Daredevil and Ms. Marvel, three books she's very passionate about, to make time for an endless array of strategy meetings. Amanat's goal is to determine how Marvel can evolve and make its superheroes more representative and diverse, and then to ensure that it happens. By doing less hands-on editing, she's able to work with the company on a grander scale and across multiple titles. In 2012, a young, unassuming Pakistani musician from Karachi created waves after being selected as a TEDGlobal Fellow, following the success of his brilliant composition, Fire Fly, which went viral a year before. Sharing stage space at TEDGlobal – a conference that brings together trailblazers from across the world to deliver inspiring talks – with his idol, the renowned guitarist, Preston Reed, Usman Riaz was quickly propelled into fame. This year, while still in its initial stages, Riaz’s The Glassworker, Pakistan’s first hand drawn animated production, brings with it the magic and innocence of a Studio Ghibli film. Judging by the production’s teaser, which was also showcased at TED this year, The Glassworker is an enchanting visual treat. Little wonder then, the fact that Riaz successfully met his Kickstarter funding goal in just sixteen days, this month. Riaz, who stands as the production’s writer, director, and unsurprisingly, composer of The Glassworker’s musical score, began drawing well before his interest in music blossomed. “I’ve always loved art and animation,” the Studio Ghibli fan stated, mentioning that after studying a degree in fine arts, music and film overseas, he felt a strong desire to channel each medium into a work of art. When Ayub Met JFK 50 Years Ago..